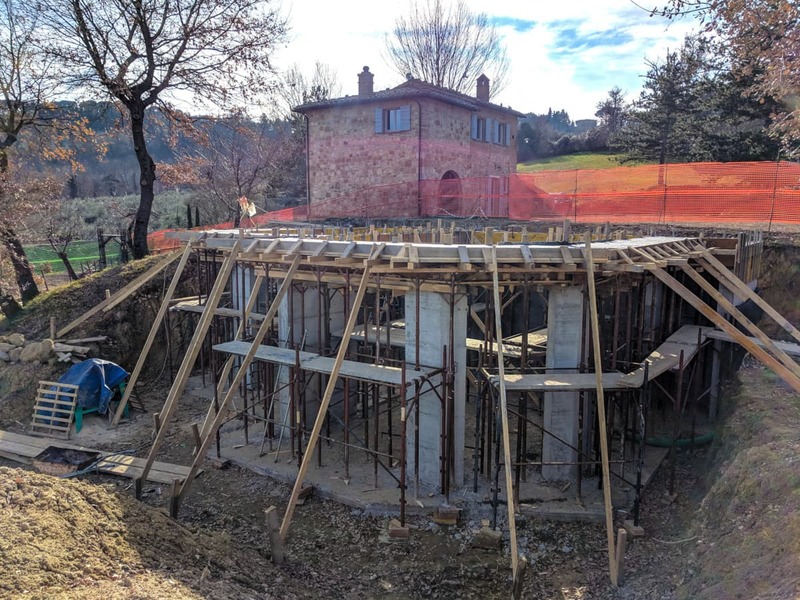 We have been really busy here at Fonte Martino working toward our Spring 2019 opening! We are very excited to share with you some of our renovation updates! Because we have a lot to tell you, we decided to break it down into a couple of blog postings. 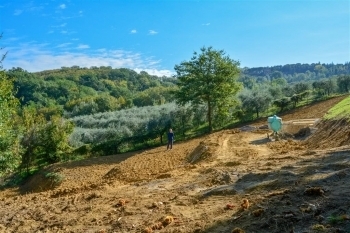 To start, we want to give an update on the great things happening on the grounds of our little piece of Tuscany. To begin, we would like to introduce you to The Montepulciano Suite. This is our first completed suite and we couldn’t be happier! 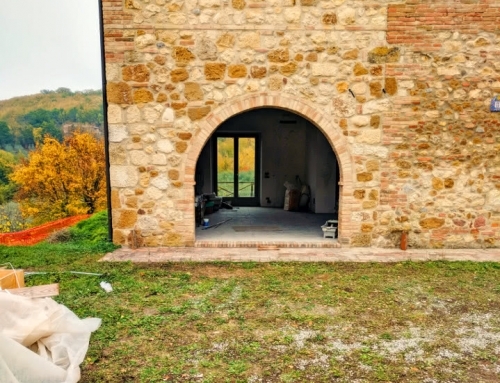 It is located on the lower level of the main house with a private entrance surrounded by a beautifully landscaped terrace and gardens designed by Signore Marco Casucci. 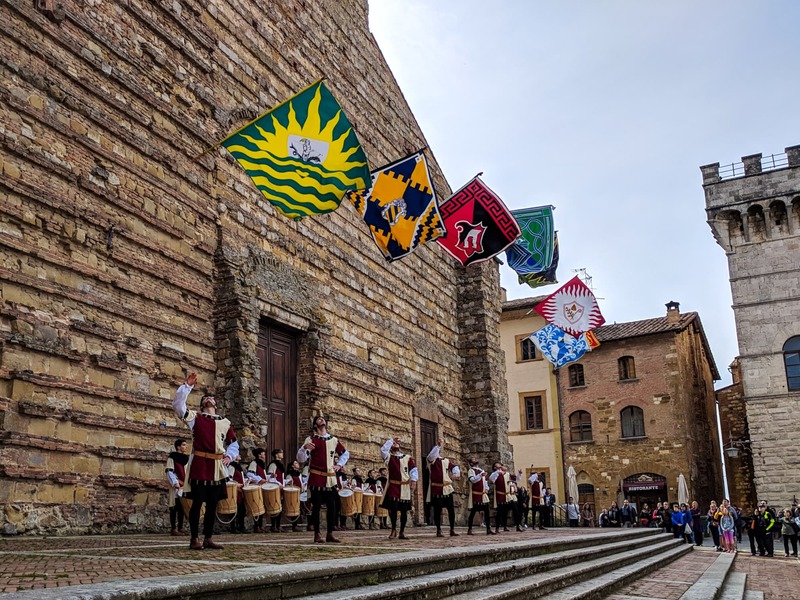 Because we are focusing on the grounds, we’re sorry but you will have to wait until Part 2 of this posting to see inside The Montepulciano Suite. We know…we shouldn’t tease you! As you can see from the photos above, The Montepulciano Suite was literally unearthed and we are just thrilled with the results. 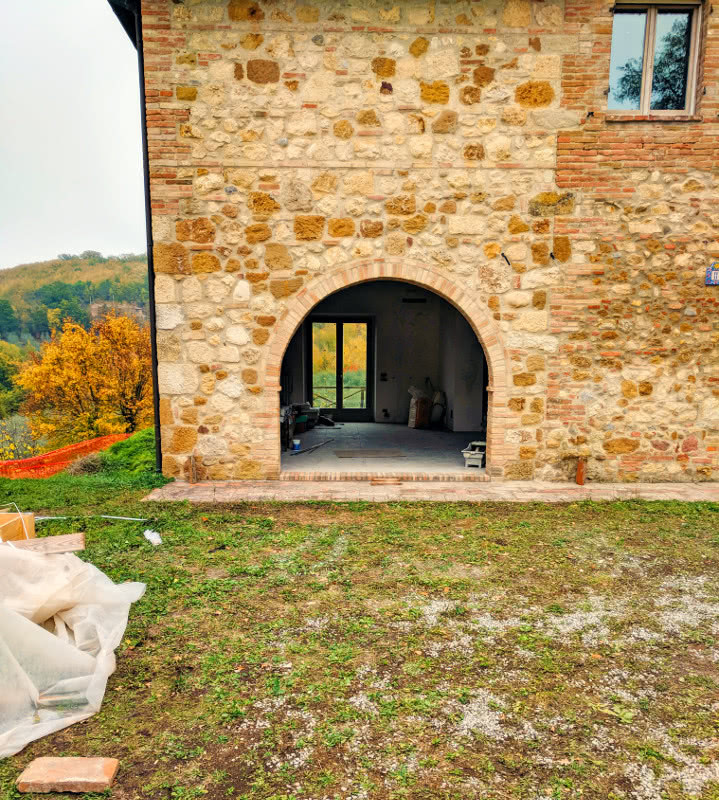 We had to remove the hillside against the house, rebuild walls, create entrances, install a portico and terrace, and then landscape – easy, right? 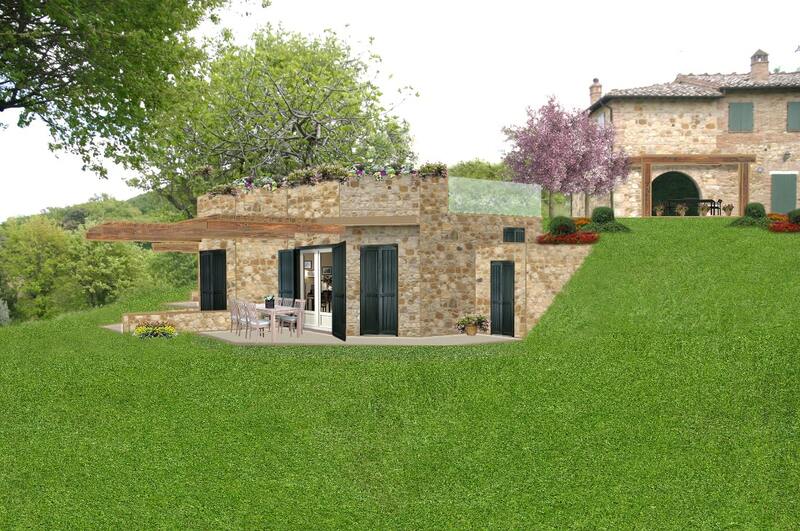 Working with Signore Casucci, we created a relaxing outdoor private lounge that overlooks the panoramic Valdichiana. 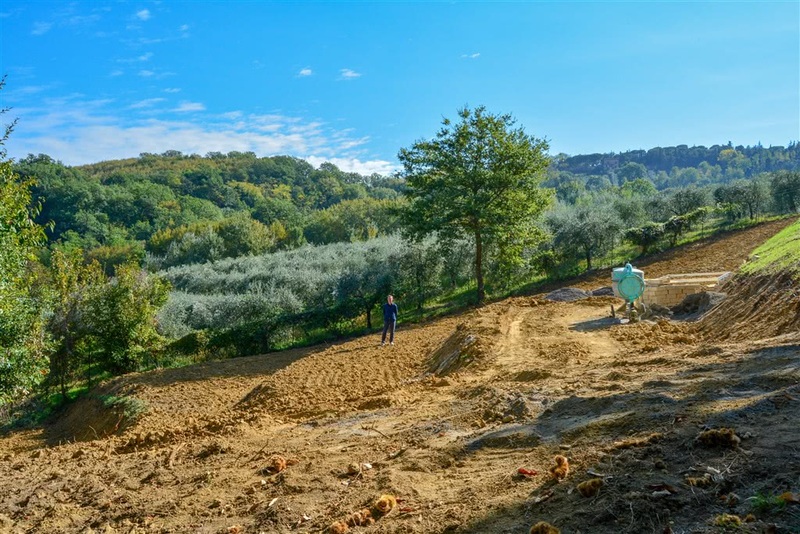 There are traditional Tuscan plantings that will create a privacy hedge that include cypress trees, pomegranate trees, and red and white roses. Upon entering the private outdoor space, you are welcomed by a lush lawn that transitions to traditional Tuscan flat stones with “Dichondra”, a lush ground-cover, growing in-between. From there, you can choose between relaxing in the shade under the portico or two chaise lounges for lying under the warm Tuscan sun. The inspiration for this entire area was to create a space for you to simply relax and enjoy the beautiful outdoors. Next is the “Orto” or vegetable garden. 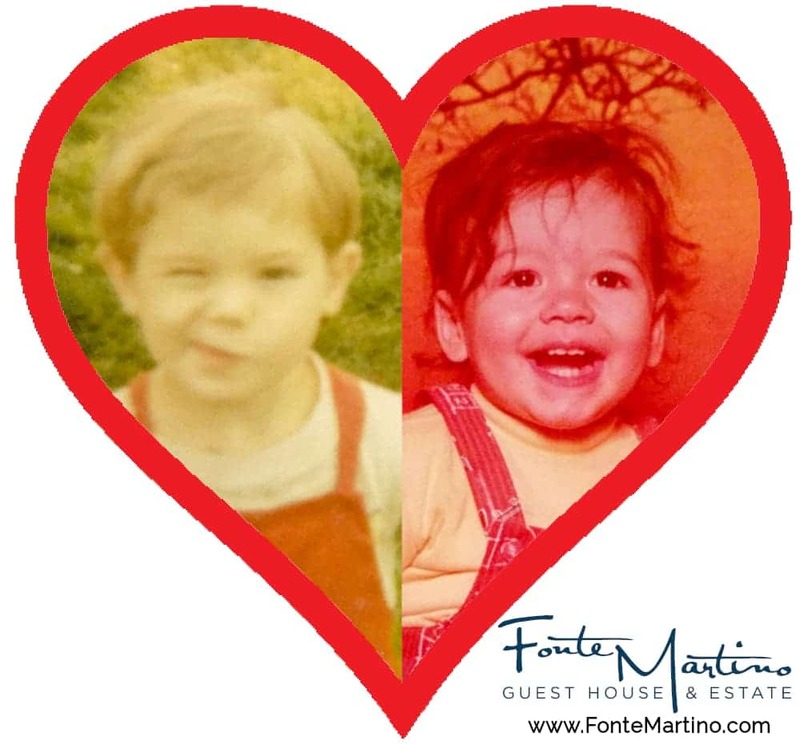 This is something that we have been thinking about since we first discovered Fonte Martino and we found the perfect place for it! We created four terraces that will each serve a separate purpose. The upper-most terrace will be home to our greenhouse and multiple raised planters to grow our very own organic vegetables. We are determined to become as organic and self-sustaining as possible. The next two terraces are still being planned and the ideas we are considering include additional fruit trees and a small grape vineyard for table grapes. Since we are still deciding what to do with theses two terraces, we would love your input! Please give us your ideas in the comments section. 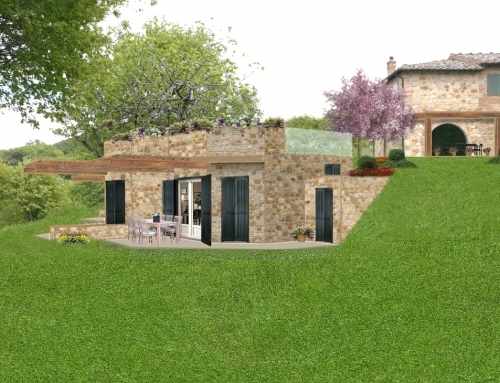 The fourth terrace at the lowest level will be home to our future chickens – yes, fresh eggs will be featured at Fonte Martino! We want our chickens to be happy, so they will be free-range with access to the garden during the day. Finally, our entrance and drive are starting to take shape. Although there is still much to do, including resurfacing the drive and installing the new entrance gate (hand-made by David’s dad), a dramatic change is starting to happen. We have planted 21 new cypress trees along the winding drive, creating a dramatic entrance to the estate. That alone was a wonderful improvement, but in the field to the left of the drive, we planted 28 new fruit and nut trees. There are 14 “Ciliegio” or cherry trees and 14 “Mandorlo” or almond trees. They flower about the same time in the Spring, so our once empty field will become a sea of white and pink, giving way to an abundance of fresh cherries and almonds later in the season! There are many more outdoor projects happening at Fonte Martino including the construction of our other guest suites, pool, outdoor lounge with pizza oven, dining terraces, etc. We promise to update everyone on those during the various stages of completion. Until then, stay tuned to our website and social media for Part 2 of this blog where we will reveal the inside of The Montepulciano Suite! Great job gentlemen! Enjoy the updates. Oh my gosh! I’ve been waiting to see an update and this delivered. This sounds like it will be phenomenal!! Thanks Tammy! You need to plan your visit! Hi Guys, love what you are doing. Can’t wait for our visit in Oct 2020. Sounds far off , but time does go by fast. Hi have an idea for your two remaining terraces. When I was in Italy last yr. Venice to be exact. I happened to notice all the terraces had beautiful outdoor tables under a pergola that had beautiful Wistera growing on them. In the evenings they lit candles and it was absolutely gorgeous. Can you imagine a couple getting married at your place? Another idea for a terrace. Hope that gives you some inspiration. Can’t wait for our trip, we are so excited to visit you both. Oh my gosh. It looks wonderful and can not believe all the work you have done. So much fun watching everything happen. Thanks so much for sharing your progress. Dreams do come true!!!!!!! Thanks Sue! The only missing thing we need is your deviled egg recipe!!! We can just hear you both commenting from the balcony! Oh boy!!! What am amazing transformation is happening! It looks beautiful!! Can’t wait to see the rest in person!!! Thanks Karen – We can’t wait for your visit! My gosh, David and Toby, you both have been busy. The transformation is awesome. It looks beautiful. Kudos to you both. 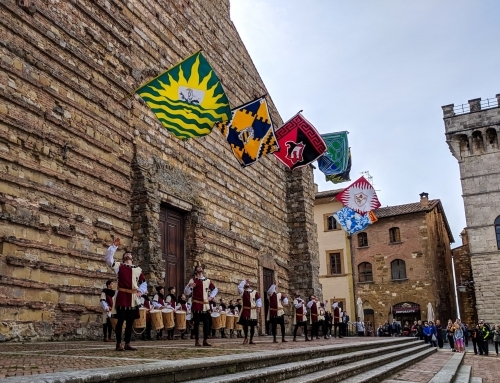 We are in Montepulciano in July of 2019. I plan on stopping by to say hi. Our next trip to Montepulciano we will be staying at your place for sure. Great job. So very excited for you both. Ciao. I was actually going to suggest the pergola and wisteria (or grape vines!) idea for the lower terrace also! Our place has a space with great Valentines over the Pergola and they use it for an organized the cocktail hour now and then, and it’s a peaceful spot for a morning cup of espresso and croissant. I’m happy to hear you’re going to have chickens. I have my own little flock here in Texas. It’s so fun to watch the various personalities of the hens—and nothing beats farm fresh eggs from organically fed chickens. I can’t wait to see the next update, and of course, hope to get by there if it works out in December. Otherwise I will get with you when we return in the summer. Great Valentines??? I just now saw that the autocorrect bug has been busy again. That was supposed to have said “grape vines.” LOL! 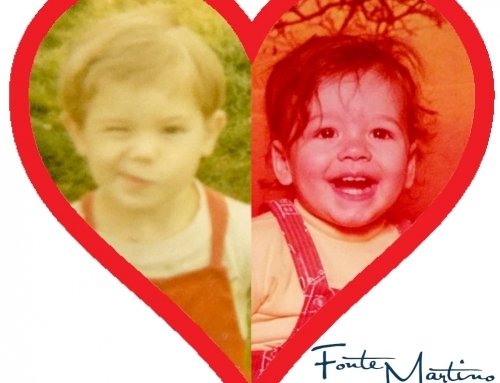 Oh my Toby and David! You have done so much! Everything is just beautiful!. Excited torn part two. Thanks Shirley! As they say frequently here, “piano piano” – which means step by step! Part two is coming soon! I know you’ve heard the saying…”if you build it they will come”, well…people will definitely come!!! What a beautiful estate you have developed and I can’t wait to see the finished project. So fun to watch your dreams come true! and mine too when I visit. There’s a place I go to in Mendocino to get away–they have a lot of chickens and every morning put eggs in a basket and leave on your door step…. When I grew up eggs only came in white but these are colorful….you can also go to their organic garden and pick flowers or veggies that you might want to include in an omelette….I love organic gardens!